"When the band was having bleed thru issues with my kit going thru every mic on stage we were looking to find a solution for this problem. We tried EVERY THING under the sun until our tour manager suggested Viggy 's trigger systems, I was AMAZED AT HOW QUICK Viggy got our system up and running. And once it was on the kit...HOLY HELL! IT WAS JUST WICKED!! The band is freaking out!!! We finally got the drum sound we've been searching for, and it's such a relief to know it will be a consistent system able to withstand the rigors of the road!! Viggy is a god!!" "Viggy's live playback sytems are bulletproof and when you're working with computers thats saying alot!!!" "Working with Viggy and his system has been, and continues to be, an honor and a pleasure. The system operates like a dream and gettin to know, and watchin the genius behind the machine has been fun as hell for one, but impressive is an understatement. I'll stand behind Viggy and his system any day of the week... And in no way, shape, or form did I receive any type of bribery for this statement... Ever… Not even the promise of gettin to hang with Mötley Crüe... The end." "Viggy's system helps me lock in video and lighting programming on a whole new level. It's consistent, reliable and very useful on large scale, as well as smaller productions, looking to tighten up their show." "Since Chicago started using Viggy's computer rig our show has taken on an even more multidimensional quality that didn't exist before. We can now not only use the computer for tempo enhancement, we also use it for additional audio and video content. All the content is synced up to two computers running simultaneously. If one goes down the second takes over seamlessly. We won't even know that there was a problem until our computer tech informs us after the show. If per chance both computers go down (this has never happened) we rely on our roots as musicians and just continue on with the show. We recommend Viggy's computer rig to any band that wants to keep up with the computer age. It's not something that will replace your show, only enhance the talent that you already bring to the stage." "I was very impressed with how user friendly Viggy made the system. He made it so I was able to get all my cues timecoded without needing to have someone with me that understood the system. I had no problems and everything was put together in a well thought out manner. During the tour the system worked flawlessly, except when the drummer hit the wrong pedal and turned it off. Using Viggys system with Disturbed enabled me to really dial in the timing of the cues." "Walking on stage knowing that PLAYBACK CONTROL has my back is an amazing feeling. The stability of this rig offers a confidence, reliability and ease of use that no other system is capable of!" 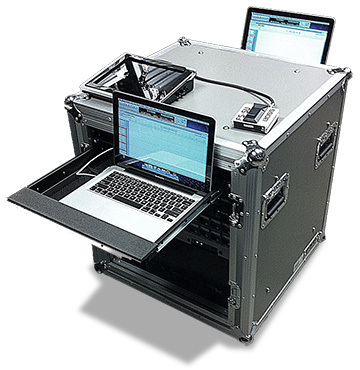 "Our video, audio and drum electronic rigs are bulletproof! Couldn't be happier! Viggy is a legend and the absolute best in the business! It's comforting to know the rig has your back night after night!" "In 2011 in support of our album Asylum, we wanted to tour with big production, lights, pyro, video, the whole nine yards. Once i found out i could program my pedal board to switch automatically thru midi into Digital Performer i was blown away. This freed me up to not have to race back to my pedals on my changes. Especially on a big stage or when there was pyro cues,it allowed me to go wherever i wanted. All my changes would happen at once without having to tap dance or be near the board." "Viggy's Playback Control is F'n perfect!! He programmed our set for the KORN- PATH OF TOTALITY TOUR '12 and I was blown away on how smooth everything went. All the electronic songs were programmed perfectly so each section of the song changed sounds to match the tones on the record. I loved the fact that I could just hit the same pad for the verses and choruses and not have to worry about anything. It's so consistent... I could just rock out, bash and do my thing and Vig took care of the rest!!" "With hardly any budget to work with on my newest solo endeavor, and always shooting for perfection, I was shockingly surprised to see how flawless, cost effective and easy Viggys video rig was to construct and operate. Simply put, I've been able to maintain Godsmacks high profile shows, all the way down to simple solo shows with zero fear of glitches or failure when including video in my set."